V.22bis,V.22, Bell 212, V.23, V.21 and Bell 103 modem software is used for industrial applications. These libraries are modular and the software can be executed as a single task under a variety of operating systems or standalone with its own microkernel. Contact us to discuss your modem application requirements. 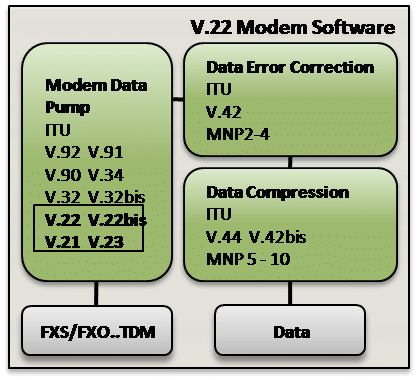 VOCAL’s V.23, V.21, V.22bis,V.22, Bell 212 and Bell 103 modem software is optimized for performance on leading DSP architectures and processors from TI, Intel, ADI, ARM and other vendors. Our modem software may be licensed standalone, as a library, or complete design. Custom solutions are also available. VOCAL’s SIP Software modem (MoIP or V.MoIP) solution provides developers a range of solutions to connect legacy dial up modems to modem infrastructure. Unlike other virtual modem designs, the SIP software modem can communicate with a physical modem at the far end using a VoIP service over an IP network. The line interface may be an analog front end (codec and DAA) or a digital interface such as T1/E1, Switched 56, and ISDN. The upper end of this software can provide a PPP, HDLC, V.14, or a direct binary framing layer. Higher data protocol layers, V.42 (including MNP 2-4), V.44, V.42bis and MNP 5, are options as well. The V.22bis,V.22, Bell 212, V.23, V.21 and Bell 103 modulation family can be combined with other data modulations including V.92, V.90, V.34, and V.32bis,V.32. Automatic modulation detection procedures (Automode) include those of PN-2330, V.8 and V.8bis. All our data modulation software is fully compatible with VOCAL’s facsimile, telephony, speech coder and multimedia systems. Data/Facsimile/Voice Distinction upon startup is available. Complete facsimile systems, modulations (V.34fax, V.17, et al.) and protocols (T.30), and speech coders available. VOCAL’s optimized software is available for the following platforms. Please contact us for specific Bell 212, Bell 103, V.22bis,V.22, V.23, and V.21 data modem supported platforms.